You are here: Home / iPad / How Do I Get Rid Of Mysterious “No Subject, No Sender” Mail Messages? How Do I Get Rid Of Mysterious “No Subject, No Sender” Mail Messages? 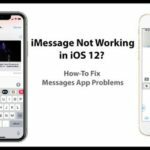 Several users have reported an issue in the Mail app on iOS devices (iPhone, iPad, iPod touch) displays mysterious messages with no subject and no sender. Some readers report they receive upwards of 10 messages at a time from no sender with no content! If force quitting didn’t help, add in a forced restart instead of a normal restart. 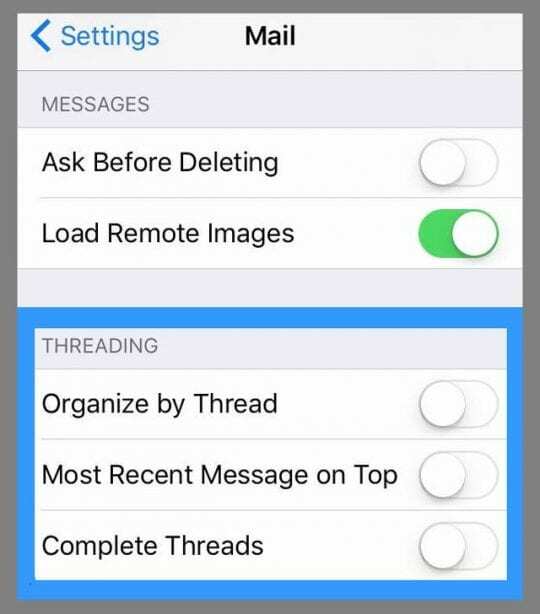 Go to Settings > Mail (for older iOS, Mail, Contacts, Calendars) and turn off “Organize by Thread.” Updating this feature often prevents phantom messages from appearing in your Mail app! Some users tell us that they turn off all the settings under Threading–and that works for them. 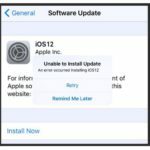 These mysterious emails often show up when users check their emails in a different time zone than the one they established when purchasing their iDevices. So it’s a good idea to take a look at these settings. 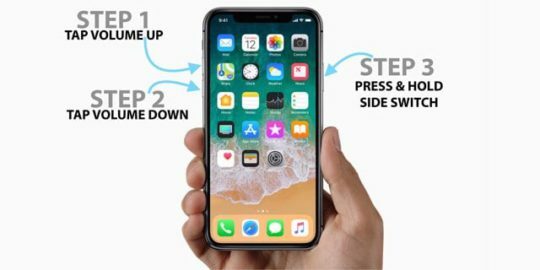 Your iPhone does not back up your email. 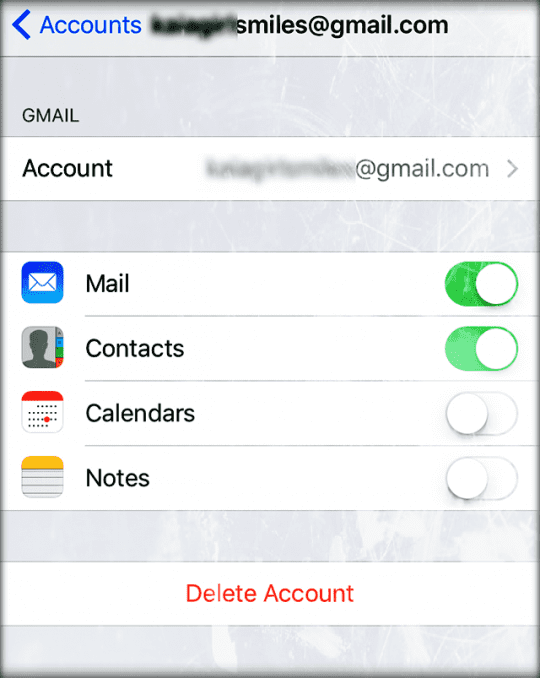 When you delete your email account, all the account’s previously downloaded emails are removed from your iDevice. So first, check that your email is in your account using a web browser. Sign in to your email provider’s website and verify that all of your emails show up in your account. Verify that your email shows up in your email provider’s website by logging into your account and checking using a web browser. None of these suggestions have worked for my iPad. I have about 60 ghost emails I cannot get rid of. Any new suggestions? The very last option worked for me. Have an iPad with iOS 6.1 that gets mail from my gmail account as well as iCloud and Comcast. Gmail seemed to be the one with the issue. When I turned off “Set Automatically” for the Time Zone a different time zone appeared. So I switched it to mine, waited 30 seconds and then turned it back on. The Time Zone stayed correct. I then closed Settings and Mail, Contacts, Calendars then turned both back on and the emails had disappeared. But in my case they were coming via Gmail, not iCloud or Comcast mail. Tried all these things and still can’t get rid of it. Thoughts? 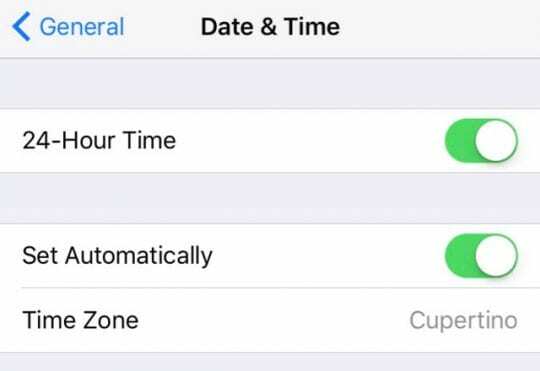 Take a look at your date and time and make sure it’s set to “Set Automatically.” If so, toggle it off, wait 30 seconds, and toggle it back on. 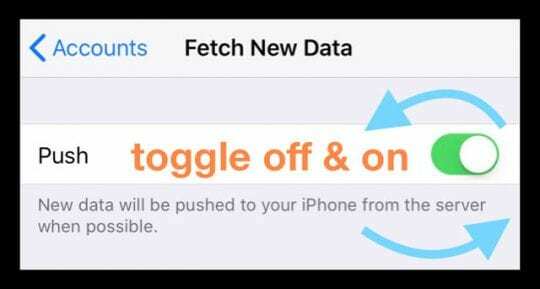 If that doesn’t do the trick, toggle the Push setting in the Mail app off, wait again another 30 seconds or so, and toggle it back on. If that didn’t work, try a forced restart after toggling push off and then toggle it back on after the restart. 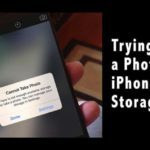 So pleased to find this article, I really didn’t want to have to reset my phone. I just double tapped and closed the mail, when I opened it again all of the Ghost mails has gone. I went into my windows computer and deleted it from there. Worked! The phantom messages are infact actual emails, that if you remove are in the webmail deleted folder, move these into the inbox at the end of this tut and your good. Sorry, should have said I turned the phone back on, then opened Mail…. Today I discovered an email account labeled Weather Alerts and deleted it. Immediately following that I received hundreds of “No sender no subject emails.” Every time I deleted one more would appear. I turned off the phone and opened Mail and the phantom emails were gone. Does this have anything to do with the Weather Alerts account issue? 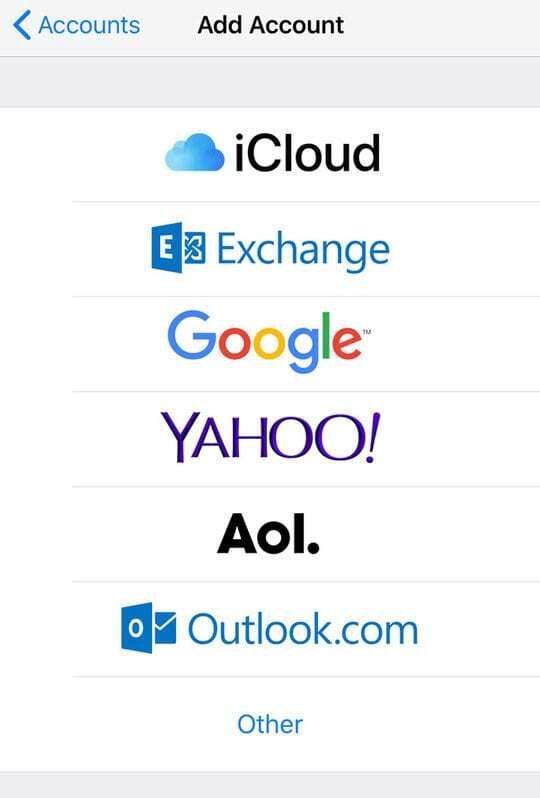 i found the best solution: i stopped using Yahoo email. Problem solved!! None of the above “fixes” corrected the problem. I have done a hard reset, soft reset, cut email off and turned back on, deleted and set up email again with only mail on. The problem just gets worse. Apple, yahoo, ATT are not any help at all. I tried to go into apple store to fix problem and discovered crowd was waiting for technical support not buying product. Steve Jobs must be turning over in his grave! Short the stock! They are too busy selling expensive items, so you are going to short the stock? Can you say: bye bye money? Thanks, I don’t use notes so I did not have a data loss issue. After deleting the emails one at a time, all my old emails disappeared and now I am not getting any mail. Can anyone help? Awesome! Thanks so much for offering such a simple solution to a very annoying issue. I woke to masses of “No subject, No content emails” as I attempted to delete them more and more appeared! Crazy! Luckily the first fix of just turning the accounts off in settings, then opening mail and turning them on again in settings worked! I am interested in how this happens though! I have thousands of those and thousands of 3 other emails, as soon as I delete the other emails, it adds more, I have 900,000 emails and about 897,000 of them are of the same 3 emails. One being No Subject and dated 12/31/2969. 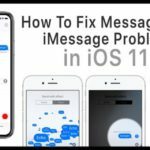 I am hoping that Apple can help me. This is on iCloud and they are using up all my iCloud storage. No subject, no content where do these come from 12/11/69? NO way to delete like other mail??? Force quit mail option worked perfectly! Great advice, many thanks. Update on this… Just hold the iPad function button ( round one on front) and also the off button on he side. 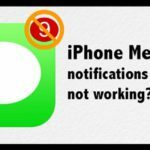 Wait until apple icon reappeared and you will wipe he’s no content messages. 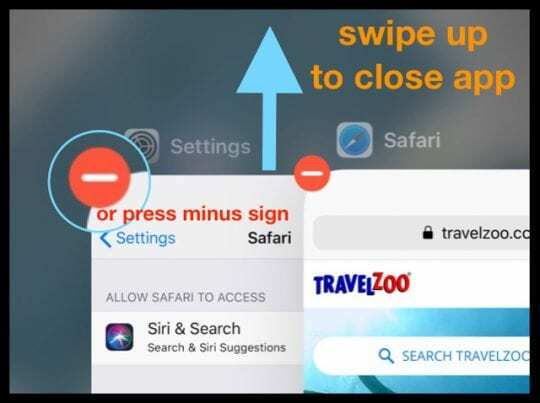 Works for all iPad and iPhone. It’s to the point that I’m about to abandon Apple totally. Where in the world is “settings” in iCloud mail? Using a Macbook with OS X 10.6.8. Using Apple “Mail”, when I do a ‘Reply’ there is no ‘Sender’ line at all, at least as it exists within my ‘Sent’ folder. People receiving that mail, for the most part, seem to be able to reply back to me so, at least some or most of the time, they must receive a normal Sender line with the email. Road runner seems to have the same issue. I saw an e-mail like that. I am having this on my iPhone 5 and IPad 4 everyday. Have tried all recommendations. 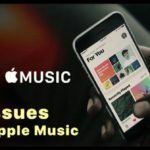 APPLE what is the permanent solution? There is a bug in your software. Are any of you getting mail on both an iPad and an iPhone? Could this be the issue? Deleting mail on one and when the other updates, content is gone? I think that you may have it!! This happened at the time that I bought a new phone and had to stop the update due to Internet failure. Are any of you getting mail on both an iPad and an iPhone? Could this be the issue? Deleting mail on one and when the other updates, content is gone???? Just got my iPhone 4s a few days ago .. 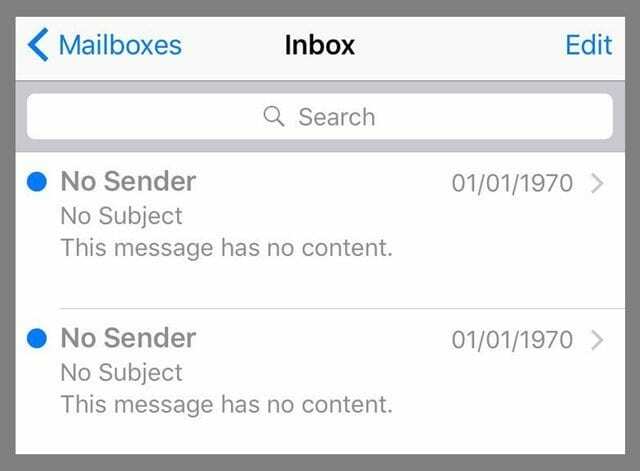 I too have had those no sender emails, about 10 of them from 1969 .. I went into the settings and followed the threading and it deleted them .. now hoping they won’t come back! It’s the weirdest thing! Who had an iPhone in 1969 anyway??? Thank-you! I went to the apple discussion pages BUT THEY WERE DOWN!! Can you imagine? The solution published works – try it! Thanks! The first one worked for me. Then back to mail and they were GONE. Then went back to settings and switched “organize by thread” back “on”. Thanks this just works for me too. It never happened on my first iPad. I have had the new one for 10 days and these ghost emails started coming in. 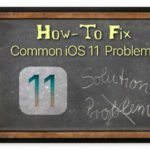 I had the same issue on my iPad, tried all suggested fixes above, none of these worked. I have an alternative account ‘other’ setup. Solution that did work for me was deleting the mail account and creating it again, not simply turning it off. This cleared the bogus e-mails from the inbox. I have aan extra account with fake settings. If you switch in your mail app to The wrong account and back to gmail, you Will see your massages. – So far (10 mins later) it seems to have no come back yet….fingers crossed. Hope this one works for people if they can’t fix it yet. Seems to have done the trick although it cleaned out the rest of the e-mail history downloaded to that account on my iPhone although it is still visible in the account on the web based server. Thanks. Thank you so much; it worked perfectly…after reading many threads with helpful hints. This is the best! i am still recieving these emails but mine have the exact date 07/11/11 19/11/11 etc and i have tried doing what is stated above!! what are they?? Is it a hack or is it a apple mail bug? Thank you for the tip! Though the first one did not help, the second one seems to have fixed the problem. I have no idea why it works, but glad that it does! Thank you so much for the tip, it worked beautifully. it was driving me mad having a mailbox full of non deletable mail items. I work in email marketing and recently one of my colleages received one of our emails on his iphone with sender present, but subject line showing as (no subject). The content of the email was present. I’m trying to figure out if this is an error on the part of our ESP, or if it’ smore of an iphone bug… Anyone got any ideas? The examples above seem to suggest both (no sender) and (no subject) show and the email is blank. Whereas with ours the sender & email content were present, but subject line was (no subject). i got a couple of these emails on my home computer; but, not on my iphone. i didn’t open them, just deleted them–i was afraid it was some malicious emails–it freaked me out. Thanks for the tips! I was getting pretty sick and tired of these no sender Emails appearing on my Ipod Touch. I did the first tip disable then re enable email whent back to mail and they were all gone. I also just turned off the notes and we will see how that works. Well, I can say that I got this problem after renaming (the description) of my email accounts on my iPhone 4 to “[email protected]”. I replicated the issue on my iPad. So for me the solution was to rename the accounts back to something without the @-sign. 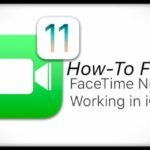 This worked on both of my devices. I had 2 dated 12/31/69. Restarting my phone deleted them. Setting up a rule that junks all mail without @ also does it. Thanks for the tip. It solved the problem!! Where do I find notes exactly in Settings? David, where is Notes in the Mail settings? It did not work for me AND I lost ALL notes…..important ones! Where are these messages coming from? I have 21 of them, all dated 12/31/69!!! Hopefully this fixes it and prevents me receiving any more. Thank you! I use my gmail account and the “Organize by thread” fixed it!